Courtney Love ended a contentious-even-for-her week — in which she angrily accused Dave Grohl of creeping on her daughter Frances Bean Cobain — with a decidedly peace-and-love move, reuniting with former Hole bandmates Eric Erlandson, Patty Schemel, and Melissa Auf der Maur at Public Assembly in Williamsburg, Brooklyn, last night. 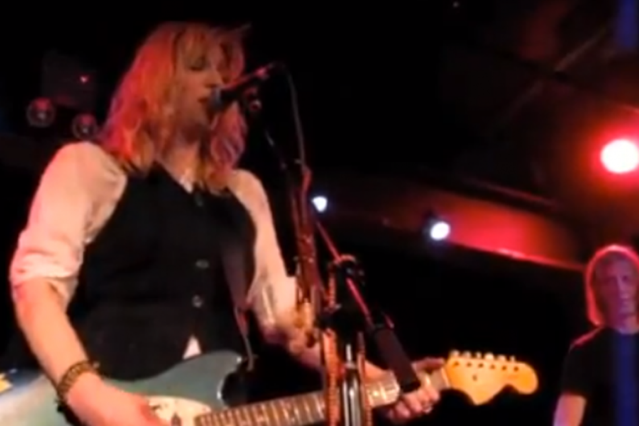 It was the first time since 1997 that the so-called classic lineup of Hole had performed together, and it lasted all of one song. Last night, it appeared that one song was supposed to be the extent of Love’s participation, but the singer — looking natty in a black vest/black skirt/white shirt combo — couldn’t resist inviting herself right back up onstage for the closing number, a raw cover of the Wipers’ “Over the Edge,” with Yo La Tengo’s James McNew subbing for Auf der Maur on bass.